The Trump administration delivered an unmistakable military warning to Moscow and the Assad regime on Saturday, May 26, to hold off from their big offensive to capture the southeastern Daraa region. The US would respond to such “ceasefire violations” with “firm and appropriate measures,” the State Department said, after Assad government leaflets were dropped on Daraa urging US- and Jordanian-trained and armed rebel fighters to disarm. Washington saw the leaflets to mean that Assad and Hizballah forces were ready to launch their offensive, after gaining a promise of Russian air and other support. US intelligence informants had also reported the arrival of Russian officers and mercenaries to take the lead of the Syrian-Hizballah operation. 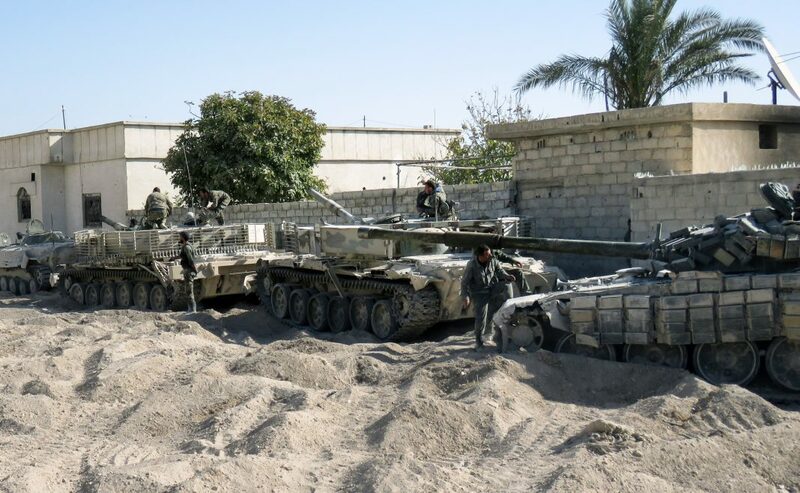 Last Tuesday, May 22, DEBKAfile was first to report Syrian and Hizballah forces massing for the Daraa offensive at the southern town of Izra, where also the Iranian command cener for eastern Syria is located. Its objective is to cut south through to the Syrian-Jordanian crossing of Nasib, and so posing an immediate threat to Jordan and reach a jumping-off point for its next operation against Quneitra opposite Israel’s Golan border. Amman and Jerusalem notified Washington that unless this offensive was prevented, both armies would have to intervene. To make sure the message was understood, a timely reminder of a past incident, which ended badly for the Russian-led Syrian-Hizballah force last February, was dropped onto the pages of the New York Times on Friday. It described the four-hour battle between “Russian mercenaries and US commandos” in the eastern Syria province of Deir ez-Zour. When a Russian-led Syrian government-Hizballah force tried to cross over to the eastern bank of the Euphrates River and overrun the US outpost there, it was thrown back by US marines under heavy air cover and forced to retreat after losing an estimated 200 to 300 dead. russians,syrians,iranians and hezzies will try running in ,,,,, the u.s army will maw them same as what we did back in february. Are you being serious? I’m hoping this was sarcasm or something similar. The USA has become rather expert at dealing with the kind of stuff you set forth in your post. With less restrictive ROEs under Trump, what you suggested likely would not work out well for those who chose to follow your recommendation. Things in Syria are rather different from Iraq and Afghanistan. Sure there are similarities which are important, but the differences are important as well. Possibly things in Syria are rather different, but Assad has to recognize Golan and the South of West Bank Israel territory, after that by simply asking publicly (at UN too) Iran moving out his troops from Syria he will have support from IDF to keep all area South of Damascus free of fights. How large does a rubber ducky have to be for it to be considered a boat? Yes Trump has taken the gloves off. There are no restrictions in terms of response, torture and engagement. Any one who thinks they are dealing with restrained pussies of the past are mistaken. Trump is just itching to use nukes and he will. Good. Blow yourselves up. Kill yourselves. I like it. Rasputin, yes Trump is the new sheriff in town and the Obama days are over – no more Mr. Nice guy. Ukraine, Crimea and now Syria – Russia has got to be stopped and taught a severe lesson. It’s difficult to say this, but it is time to do a targeted nuclear strike, sure Russia may respond but very few of their missiles will get through. Our losses on the continental U.S. will be very low – probably less than 10 million casualties. Sure there will be nuclear winter west of the Rocky Mountains but that will blow over in about twenty years. After all our national interest in Syria are so critically important that thermonuclear war is worth it. Bloodthirsty are you americans. Not only are you executing 4,000 innocent babies per day, but, you have killed some many innocent lives through needless wars. Yeah, it is making sense why G-d did not bother to mention you americans or your country america in His Holy Bible. Which only worked because Obama tied the hands of the US military. Back in February, you managed to kill 2 000 000 of them so there’s no need to worry, none are left for any kind of offensive actions. You can just lean back and relax, eat your popcorn, drink coke and keep on piling your dear American fat while watching Hollywood movies and reading about even more fantastic news of victories that never occurred while the ultimate defeat of your forces is being carefully prepared and is nearing fast. Good luck when reality strikes soon. I’m impressed by your English, Ivan. Anyway, good luck delivering “reality” to US forces. Again, no foulness. A welcomed posting. Some decades ago I was in the US Army – only 7 years, but I do support our military. With President Trump at the helm, I am glad to see Christians aren’t being further ‘castrated’. Peace. To: Texas Dave: How come you keep posting on this Jewish website? You should post on Christian Websites. Stick with your own people. And preach there. Lol…..the US and ISISrael ate occupying Syria and they are telling people to back off….the end of the US and ISISrael is nigh and sooner the better for this world…..
Say it again, strike them hard , maybe the only message they understand… in the long run. It is gratifying that the administration of Pres. Trump draws red lines. Russia-Iran-Syria form an evil triangle of terrorism. Putin is the vampiric grand master of absolute evil together with his bedaubed with blood mullahs. To understand the point of view of 90% of the population (not pro-western elites and not multinational businesses or pro-nazi) of Ukraine and Russia ie. one, white, russian speaking people it’s roughly as if (sorry for the details) spanish dark skinned Mexico were dumping english speaking white Texas and then said “The US must be stopped.” Mexico even has more rights. Ukraine was born as the state by the USSR . Cremea, since the collapse of the Soviet Union, has rebelled against subordination to provincial Kiev. Sometime around 2012, Syrian Druses in this are asked Israel for protection and intervention. Regrettably dove factions in israeli cabinet prevailed. Syria is too large a country made out of too many small ethnic communities so much different in culture. Plus is placed in the dark side of the Middle Orient, where killing is a way of talking. Turkey, Lebanon, and Iraq, are in the same situation. For the first 100 years each group has to have his own small territory as a country with regular borders and guaranteed by high powers (Israel, Russia) as to force disarming and interdict fighting. Then, they might develop by themselves the knowledge to live together, based on an economic union. Or by force, because they have a very weak and stubborn “themselves”. It would be wise not to try him. US has lots of new weapons itching to be used. Does farting loudly during a concert make you part of the show? Best comment so far..You made my day, pal..!! The Iranians and their proxies, Syria and Assad’s forces and supporters should not attack US Forces or Allies in or bordering Syria. It would be wiser to negotiate a Peace in Syria with backing of President Trump and Putin, than have the Iranian dogs wag the Bear, to a suicidal war. The Mullahs days are numbered as the Iranian People and Mothers are fed up with losing their sons and being relegated to a subservient life without freedom. Maybe it is time they spank their theocratic fanatic sons. Putin is an patheticliar. Initially he has even denied russian involvement in the Crimea crisis when his mercenaries operated without insignia at that very place. About his engagement in the Syria war theatre he tells his dimwitted russians that Russia is with this intervention a “super power” again while just sending forces in limited numbers there as russian military technology is that “strong and poerful”. In reality Putin has send tens of thousands of his criminals Russian paupers and ex-convicts) and terrorists (Chechens et al) to Syria who operate under the cover name “Gruppe Wagner”. “Gruppe Wagner”, the iranian terrorists plus the Hezbollah terror gang and some terrorists from Afghanistan are the only forces which keep Bashar in power. The Iranians do not value the life of their own citizens? Have you ever been there? Also to a statement earlier about Russia and the Crimea. Crimea has always been Russian. Russia Has a more traceable and provable right to the Crimea then. Israel has to Palestine. I am not here to say that Israel doesn’t have a right to the land they do I have always believed in an Israeli right exist The problem it is from a spiritual view not a political and legal view. The Temple was destroyed for a reason and the drawing back of God’s people to the land is just so he can re veal his power. Eventually repentance will have to the place. As far as the connection between the USA and Israel Jews have always thrived in a liberal tolerant society. the democracy in the US provided that I think though that the most read person that favored democracy was an atheist, Israels God didn’t exist to him. @give back russians bodies ONLY in presence of medias@ lol . The Russian people are not fools – they know that Syria has military personnel of all countries, even China. The leaders of the Russian media and journalists hide this – maybe they are stupid, but who cares . 1. V. Putin may be a maniacal Russian despot – but he is also a military Realist, who appreciates both Israeli and USA ultra-advanced cybernetics and weaponry. rag-headed numb sculls, exposing their seldom washed, smelly a^*es ! Reminder: Putin is also accountable for the downing of MH 17.We’ll never forget them.One day justice will be done.Watch your back Putin. Yes, putin is accountable but the downing of MH17 was a mistake. Incompetence. The US and Israel have made mistakes too. The US shot down an iranian passenger jet and Israel attacked the USS Liberty. I’m sure there are other examples. However, russia needs to get out of the region too. It clearly has no fangs. Its technology isn’t all that good after all, nor is its famed military prowess. Its over-reaching itself in syria. Knowlegeable Professor: I’m sure even Albert Einstein would be in awe of your stupendous intellect. Thank goodness for your post. You delusional and sound like a child on crack – go get a life on another planet. You have ignorant beliefs and claim to be better educated? Take your noncense elsewhere. No, sorry you don’t seem very erudite. The ‘gamble’ approach has already played out. That was to allow iran and hizballah to gain a presence in syria. This phase has definitely ended. Israel can certainly rely on US support for the next few years, in which time, reasonably it can be expected that matters will have come to a head. Yes, the russian-led force at daara was outmatched, but you fail to consider the consequences of bringing more hardware ‘to the next party’. The US has by far the largest military in the world, and ably assisted by Israel (which has clearly shown its abilities), will make life very hard for any adversary. This is the irrefutable message, and events leading up to this point, weigh in Israel’s and the US’s favor. Trump has given the military ‘permission’ to do what its supposed to do. daara was part of that. Putin is is the vampiric grand master of absolute evil together with his bedaubed with blood mullahs and their deathsman from Hezbollah. Fortunately Pres. Trump and his excellent staff with Bolton and Pompeo on top are well aware of that. Otherwise PM Netanyahu, while himself an excellent leader like our beloved Donald, is still too gullible in all affairs concerning Russia and especially that evil despot Putin. Russia’s Putin is the Prince of Rosh, the head of the evil empire, like that wicked shithole was called rightly by great Pres.Ronald Reagan. Be aware of the Russians! It spreads its errors since centuries, no matter if tsarist-imperial, communist or putinist-fascist. A actually the United States has become the evil empire If you are looking at the scriptures in Ezekiel and think that they pertain to Israel, read those scriptures again and then read Revelations 20: 7-8 It is still pertaining to Israel just at the end of the 1000 year reign of the Messiah. Jews will still have to repent regardless. while you are reading Revelations 20, you might as well read the entire thing. I am not anti American but I am anti American foreign policy and it has to do with multi-national corporations when that interest conflicts with their support for Israel the Money will win out. Besides the only future that Israel has is what God has planned for them and that Occurs after this period. Your government will have to fall for it to have a future with the Messiah. Israels government is corrupt as well always has been According to the world community David Ben-Gurion formed an illegitimate state. well, that is Your opinion. Methinks you are very pro-russian and anti-capitalist. I have been told this pro-russian agitprop since the 1950s. It bores. I await when You proclaim to us that the wicked despot Putin is our real friend and ally. I am US and ISR citizen and can identify myself very well with the agenda of the coeval administrations. You have no business having dual citizenship. We have had people in our government that has both and we do now. Are they representatives of the USA or Tel Aviv. Anti capitalist what does that mean? I am just pointing out the truth. Been in the military been to Leavenworth I have an idea about military preparedness and logistics. The US is at an an extreme advantage. . I think that the Russians would prefer the battle hit in the Persian gulf ( if it is to hit). I do not think that the Russians want war they would just prefer that the US leave the European theatre. I really do not think that they want to enter into a war with Israel, they will if they have to but they would prefer not to. They need Iran to stop Islamic influence in their country that the United States has supported. I understand the Russians and their desire to have security on their borders (no difference than Israel). All Russia has to do to win is catch several carrier groups together and one swift move and the US cannot fight, it is over. Will Putin do that? What would you do if you had that opportunity? For Israeli’s it is between you and God. We do not need to understand Russia. That shouldn’t not be our (ISR, USA, UK) interest to comprehend the needs of that inherent backward empire and its scheming leadership. They are our enemies more than KSA, UAE, Egypt or whatever. Even Iran’s new might in the region is result of EU and Russian subsidies. I see this all from the perspective, beginning with brave anti-russian campaigns by the Polish-Lithuanian Commonwealth in the 17th century, the containment policy by the great British Empire during the “Great Game” and the Cold War and the following neo-conservative approach by esteemed free thinkers like Wolfowitz, Rumsfeld and Bolton. Nevertheless I appreciate Your comments as for the most part we read here kindergarten niveau concoctions and very often iranian/mohammedan/russian trolls. USA, Babylon, the great, with the counterfeit savior, the lawless capstone of the Zionist colonial edifice, the idolatrous jewish state entity in Palestinian Suriyah, which the Lord will put an end to with the appearance of His coming. Second Thessalonikeus 2:8 Then that lawless one will be revealed whom the Lord will slay with the breath of His mouth and bring to an end by the appearance of His coming. russia militarily is in weak position in syria whetever the scenario of any war in syria against russia.in the air russia is weak and we saw its weakness since. with land forces it is the same thing. America is going down they want war every where war. They cannot survive without it. After years the dollar will be replaced all USA economics dominance will be gone. USA cannot tell Europe China Russia what to do and hold them ransom. If saudy Arabia said tomorrow I am ditching the dollar USA will cause the so much trouble. You will see a different Russia when the world cup is finished.more aggressive policy. Now Putin know the US position on Daraa, peace or war what will it be? So what was the authorization for US forces operating inside Syria in the first place? Betcha that Assad didn’t invite them … and I’ve not heard that there exists a “UN mandate” … and so far as I have read Syria never attacked the US in an act of war prompting a response …. and did Congress authorize the US military to go there …? There is a simple reason why the Red Army won WWII: the Soviet soldiers were appalled of what the Nazis did to the occupied land and its inhabitants. The Russians don’t fight well when not defending their homeland. There were many reasons why the Russians got involved in Syria. One of them is an estimate that approximately 4,000 Russian Muslims joined ISIS in Syria. Putin wanted to defend the homeland by killing them in Syria instead of hunting for them in Russia. While traditionally hating the Arabs (even more than hating the Jews) in general the Russian population supports Putin having the Muslims killing each other in the ME. Hence it would not be surprising if Putin intends to have Hezbullah hammered in the planned new offensive. He wants full control of Syria. Iran and Hezbullah are now outliving their usefulness in Syria. A weakened Syrian army also insures that Assad (or his successor) will remain Putin’s puppet(s). To sum up, in order to control ME Putin wants both Muslims and Israelis weak i.e. fighting each other until he can control both. Once the ME is under Russian control the European countries will have no choice but install its own puppet governments in order to obtain energy from the Russian ME. At that point EU technological resources will be used to upgrade Russian economy and weapon systems. Russia/EU/ME will emerge as a monolith economically threatening US and China. All 3 superpowers will diligently work together to stop anyone else from acquiring superior weapons. Israel is an obstacle to the depicted above Russian “Nirvana”. Israel may not go along with Putin’s plan. Now you know why Soviets won.They killed everybody who dont wanted to fight. After the war many people from USSR(and Poland) stayed in germany.They dont wanted to live under communism. For Muslims you are right.A guy from Tad. told me they acted there like they act in Europe.If they are alone they are friendly,if they are 2 they start to make jokes about you,if they are 3 they look for a fight. England was working hard to help elect POTUS Roosevelt (“Desperate Deception” by Thomas E. Mahl) in 1940 in hopes he would enter the war against Germany but the Isolation Movement was still strong and Congress were holding his Administration to the Letter of the Law when it came to supplying War Materials England purchased using borrowed America Funds. FDR hoped Russia’s Communists and Germany’s Fascists would fight each other but the Russian-German Non-Aggression Pact and Pearl Harbor ended that FDR wish. After Hitler attacked Russia under a combination of America $11 Billion in Military Aid, Russians defending the vast Mother Russia Homeland, Hitler’s mistakes, bravery of Russians obeying Stalin orders not to be captured under Stalin’s threats (Over 2 Million Russian POW’s captured but 600,000 chose Suicide), when told they would be transported back to Russia to Stalin’s fate. The Soviet Union suffered the highest amount of total deaths (including military and civilian) with between 21,800,000 and 28,000,00 dying during World War 2, follow by China and Germany. In essence, FDR was right since Germany Nazi’s Fascists and USSR Communists seldom value life among each other. This is why the World (USA, Russia, China, India, Europe, Mideast Coalition), should unite to stop Iran and North Korea, that do not value life of their own citizens let alone others and sewing seeds of proxy wars by funding them. Future Bio-metrics will be able to trace everyone and and weapons as well and World committed to Peaceful Prosperity is the solution among all of us. Daraa….What country was that in again? USAMO, illegally in Syria, allied to the body snatchers..
‘tells’ Syria not to ‘capture’ its own territory ? Russia experience in Afghanistan was a disaster for them for 10 years and America experience was far more effective in 6 weeks when it began way back in 2002. Lessons continued to be learned even after America is still there as 17 years prove while holding its own and making changes. POTUS GW Bush said it would take 30 years and so as POTUS Obama and POTUS Trump have followed it. Russia and Syria would do well to avoid moving with Iran and really should consider taking sides and joining an Mideast Arab Alliance in causing Chaos and Havoc in Iran in the future as it grows weaker from sanctions and unlike in 1946 Russia would be welcomed. Once Iranian Terrorism is removed in the World with Regime Change helped by over 30% of the Iran’s population of Azeris, Kurds, Arabs, Baluchis, and Lors. This can happen and move the entire world to a Brave New World of Prosperity sharing with all. A Democratic Reform in the Republic of Persia removing the Religious Oligarch and Republican Guards shall and will be done. The problem that ASSad has is that once Russia uses their S-300/400’s, America and Israel have every right to destroy them with swarm weapons and destroy the Russian air force in Syria with gen 5 fighters – which can be done in a morning. After the allies achieve air superiority, any ground offensive will be turned into another “highway of death.” And I’m not sure that Russia, with 25 jets in Syria, could even defeat Jordan’s air force who fly the latest F-16 packages. ASSad is asking Russia to commit suicide by going against the allies and I’m not sure Putler will bite on that. Joe, you really shouldn’t be making comments. The United States really does not have access to the battlefield. Israel does but it is such a small country and if Russia didn’t allow Israeli planes to leave the landing strip they couldn’t.t have attacked from Lebanon or Jordanian airspace Russia could cover the entire country with Missiles and electronic jamming. The US has a base in Saudi which wouldn’t last long any other base close is NATO which the US would not have access to Russia would ha e access to bases in Turkey, Iran, Syria as well as bees in Russia which is within striking distance to Israel and Saudi. The war would be over before A carrier force could get there Russia can control the Med, Persian Gulf, and China could block the South China Sea In every situation the US would end up going to Nukes. Every one knows this. The Syrians the Iranians and the Turks have too much manpower at the Point of attack for Israel to have a chance. It won’t take much to provoke a collapse of the USSR economy. You twats are fckd. Russia is a nuclear power. Your biggest problem is Russia conventional military inbalance. In short, Russia has no reason not to nuke you so as to level the playing field. When you look at its military configuration you realise that Russia is fully prepared for global nuclear conflict because it is pragmatic. It has concentrated on on missile delivery and missile defense. It knows that there is no reason to face you with conventional military strategies. Pushed too far it will strike. You have far more to lose from that. In the meantime it will keep chipping away at your hegemony like a mad dog and China will rise and rise.